Due to the diverse nature of its inbound tourism, the Canary Islands have witnessed a phenomenon in which businesses specialising in a wide variety of foreign cuisines have gradually taken up residence around the coastal areas. Such a strong presence of international restaurants coexists with local establishments that stay faithful to the tasty traditional Canarian recipes, as unique as the landscapes of this volcanic archipelago in Spain. In today’s post, we have gathered useful information about some of the best restaurants in Gran Canaria according to reviews by both insiders and visitors. Our top picks are located in the southern holiday areas of San Agustín, Playa del Inglés and Maspalomas, and all of them are within walking distance of the beach. When looking for places to eat in Gran Canaria (Canary Islands), regardless of the time of the year when you are visiting, the sub-tropical climate will probably make you crave fresh Mediterranean-style food. In such case, the Greek Taverna inside the shopping centre at San Agustín beach might be the right choice. Open Monday through Sunday from noon to midnight, it offers the finest Greek dining based on high-quality products and served with utmost care in a peaceful atmosphere and a beautiful setting that is not only decorated with images of the Greek islands but also features stunning views of the area. Whether you are visiting from Greece or you are a fan of the Mediterranean cuisine, here you will get the chance to enjoy authentic Greek food including feta cheese in all its variations, tzatziki, dolmadakia, grilled haloumi, spanakopita, pork or chicken pitas, prawn saganaki, mousaka, soups and salads. As could not be otherwise, for dessert you may choose among the traditional baklava, greek yoghourt with almonds, honey or strawberries, chocolate cake or ice cream. Open to customers 365 days a year, Las Camelias is held in high regard by locals and it never disappoints visitors. 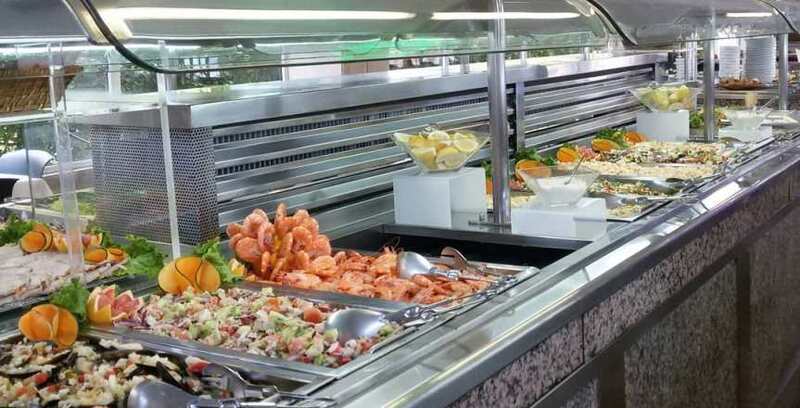 This buffet-style restaurant in Gran Canaria is conveniently surrounded by many holiday apartments and hotels in Playa del Inglés. For a fixed admission fee (they have a children fee as well), you may help yourself at the different areas –cold dishes, hot dishes and desserts– as many times as you want; drinks and grilled meats are served for a surcharge. In spite of the fact that tables at Las Camelias are always on high demand, the experience makes you want to come back thanks to the excellent service by the staff, who will ensure that empty plates won’t pile up and are ready to assist at all times. The food selection is ample to suit all tastes, even adapting to the needs of vegans, diabetics and coeliacs while it also must be noted that, especially during weekends, it includes traditional Canarian food. Advance bookings for celebrations and banquets are admitted, and required if they are for large groups of customers. On a privileged location between the Maspalomas lighthouse and the renowned Café del Mar, the Maximillian’s is arguably one of the best places to eat in Gran Canaria. At this Italian restaurant, you can have the most delicious specialties in an exquisite setting with lots of natural light and sea views. Its working hours are Monday through Friday from 12:00 to 00:00, and the menu features a vast array of pizzas, risotto dishes, focaccias, pasta and desserts. To wash it down before heading to the beach or going for a sunset walk along the promenade, you may relax while sipping on a glass of Möet Chandon, Dom Perignon or your choice from a wide selection of Iberian and Canarian wines.